Age is just a number to Matt Sen as he aims to make the most out of professional boxing in his thirties. He made his pro debut 10 days after turning 30 in July and steps through the ropes for his second bout on Friday night (December 1) when he takes on Nottingham’s Russ Henshaw. Coached by Peter Christie and managed by Gary Stern, the Black Country cruiserweight – full name Matthew Sennett – is originally from Heath Town in Wolverhampton but now lives in Oldbury. Sen first took up the sport at Wolverhampton Boxing Club as a youngster and has fought on the unlicensed circuit as an adult.He’s now looking to make his mark in the pro ranks and build towards a shot at the vacant Midlands title, which hasn’t been contested in nearly five years. Dilly Singh, Josh Burke and even Antony Woolery – the latter a new addition to the pro game – have all made noises about challenging for the belt. Sen believes boxing’s big men have a longer shelf life and is hoping to carry on fighting until he’s approaching 40. “I think lads at the higher weights get hit harder but don’t use as much energy,” he told bcb-promotions.com. “If you box smartly, you can go on for a long time. “I want to have seven, maybe even eight years left but I agree there’s no time to waste if I want to achieve things. The Midlands title is my goal. “There’s a few names in the mix but none of them are that experienced, so I need to get a few fights out of the way as soon as possible. “We’re trying to build a local fan-base and it’s a good time for regional boxing, so there’s plenty to work towards. Sen worked hard to outpoint Kalinovskij on his paid bow, at the Holiday Inn Queensway in Birmingham, and prevailed by one round after four, 39-38 with referee Kevin Parker. “I was relatively happy, as you should be with a win but there are a few things I could have done better,” he admitted “We’ve been working on my timing, distance, punch selection and more fitness since then, those are the four key areas that we’ve identified. “There’s been better sparring and more of it, against good calibre opponents. I only got back into boxing as a sparring partner. 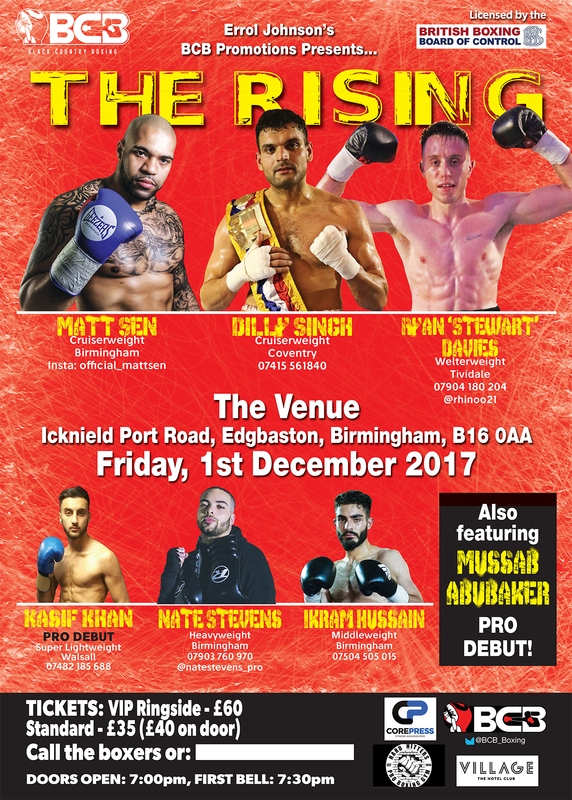 Debutant Mussab Abubaker features alongside Coventry’s Dilly Singh, who once again fights at the venue where he won the British Challenge cruiserweight title. Tividale’s Ryan ‘Stewart’ Davies is in action whilst, at the top of the bill, the English light heavyweight title will be contested as Barrow In Furness’ Liam Conroy defends against Southampton’s Chris Hobbs.